“And so the passage [John 14] is exclusive, deeply so, insisting on Jesus alone as the way to God. But it is an exclusivity on the other side on [sic] inclusivity. First, there is exclusivity. Jesus is the only way...then there is inclusivity. The kind that is open to all religions...that there is one mountain, but it has many paths...and then there is an exclusivity on the other side of inclusivity. This kind insists that Jesus is the way, but holds tightly to the assumption that the all-embracing, saving love of this particular Jesus the Christ will of course include all sorts of unexpected people from across the cultural spectrum. As soon as the door is opened to Muslims, Hindus, Buddhists, and Baptists from Cleveland, many Christians become very uneasy, saying that then Jesus doesn’t matter anymore, the cross is irrelevant, it doesn’t matter what you believe, and so forth. Not true. Absolutely, unequivocally, unalterably not true. What Jesus does is declare that he, and he alone, is saving everybody. And then he leaves the door way, way open” (Rob Bell, Love Wins: A Book About Heaven, Hell, and The Fate of Every Person Who Ever Lived. New York: HarperOne, 2011, pages 154-155). Today’s post will spend some time on Rob Bell’s book, a controversial book that has heatedly aroused (and rightly so) the evangelical world. Rob Bell examines John 14:6 in the passage of John 14 and decides that the passage teaches what he calls “an exclusivity on the other side of inclusivity”---that is, Jesus is “exclusively” saving everyone (no other provides salvation), but that Jesus is doing this through all the world religions. But this view has its problems, particularly within John 14 itself. What are we to do with the first words of John 14:1---“you believe in God, BELIEVE ALSO IN ME”(Jn. 14:1b, NKJV)? Jesus is not merely stating in John 14 that He is saving the world...rather, He is also stating that He, like Yahweh, must be believed upon. To use the distinctions of the inclusivist, the passage is not therefore merely teaching the “ontological necessity” of Jesus for salvation (that without Christ, there would be none), but also the “epistemological necessity” of Jesus: that is, one must trust Him and believe on His name in order to experience the salvation that only He provides. Sad but true, Jesus doesn’t “leave the door open” for someone believing in Buddha, for example, to be saved UNLESS he or she calls upon the name of the Lord and declares Jesus Christ to be their Savior and Lord. Buddha was never “the chosen One of God,” was never appointed to take away the sins of the world. Neither was Muhammad, nor Confucius, nor any of the gods of the American Indian religions, etc., were appointed to this task. There is only one that took on the sins of the world, and His name is Jesus. And for those who choose “any other lifeline” than Jesus, there is no salvation. Those who choose “other than Jesus” will die in their sins and will spend eternity in a place of darkness apart from God. Hell is all that awaits the person who entertains such thinking. I understand that my exclusivist thinking doesn’t sound kind and palatable in the world in which we live, but telling people that they cannot earn their salvation is harsh but true as well. The truth will always hurt, and we’ve gotta get over the notion that truth will always make us feel good about ourselves and will always pamper us. Sometimes, the truth is gonna hurt like a nail in the foot...and we’ve gotta deal with it. Jesus is Lord, and it is His Word that gets the final say. I don’t make the rules, I’m just the messenger. What is the inherent contradiction? Take this example. Let’s say that you are trying to get to the nation’s capital (Washington, DC),and that you wanna find the fastest way to get there. Unfortunately, you look for directions everywhere online and ask co-workers...only to get the answer, “You have to take the DC Ramp.” Now, having traveled on the DC Ramp about two years ago, I can tell you that the ramp is crazy! There are people everywhere on that ramp, all the time. I traveled with a friend to visit family and friends there one summer, and it was July...and the Ramp was still crazy busy!! All of this to say that, in your search for a fast route, you end up disappointed. You are told, “the only way” to get to DC is by taking the ramp. But then, the day before you get on the road, a friend of yours keeps thinking about how to get there, and he tells you, “Hey, I think I know a way you can go around the DC Ramp without having to actually get on it. And since the ramp will require about 2 hours or so of sitting time, I know how you can speed up your trip a bit without it.” So you listen...and you decide that you like the idea of this alternative path. You listen, write down the directions, and the next day, you try it out. You go around the ramp and...sure thing, you get to DC much faster than you had planned. Thank God for good friends, right? In the above example, one was told that the DC Ramp was the “exclusive” means to Washington DC. In other words, by the word “exclusive” one means to “exclude” other possibilities. If two things are “mutually exclusive,” like “eye color” and “height,” then these two things will never have anything to do with each other. If a club is “exclusive,” it will have certain qualifications that will admit some while keeping others out. College scholarships and merit awards are like that: based on a certain grade point average (GPA), extracurricular activities, and life plans, some individuals will be eligible for scholarships while others will not. Scholarships then, provide the meaning of “exclusivity”---by their qualifications, they prevent everyone from having a chance to receive them (sad but true). Back to the Ramp. If you started out thinking there was only “one” way to get on the ramp, but then got directions to go around the ramp and still made it to Washington, does the alternative route NOT do away with the exclusive nature of the DC Ramp (that it is the only way to get to Washington DC)? It doesn’t make sense to say, “The Ramp is the only way to get there,” and then turn around and say, “Oh, but you can take this alternative route instead.” Alternatives “alter” the idea of exclusivity---that is, they provide other ways or means or selections of products that one can choose from. In this case, the alternative provided another way of travel to Washington other than the dreaded DC Ramp. If this is true with the DC Ramp, how much more so with the issue of salvation. If Jesus asserts exclusivity in John 14 (not only that He saves, but that those who desire salvation must believe in Him), then is He NOT excluding others like Muhammad, Buddha, Confucius, etc., as possible persons to believe in for salvation? When Jesus says, “I am the way, the truth, and the life” and “no one comes to the Father except through Me,” is Jesus NOT saying that coming to the Father “through Buddha” will not save? That coming to the Father “through Muhammad” will not save? That coming to the Father “by human merit” will not save? Is this not an inherent contradiction? That “there is only one way” but “there are other ways”? By so doing, he is able to merge “exclusivity” and “inclusivity” together to create “an exclusivity on the other side” of inclusivity. 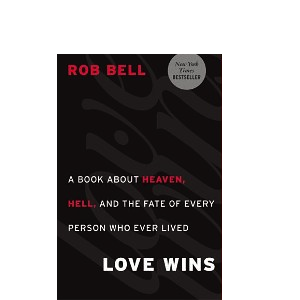 His goal is to have a little of exclusivism with a little of pluralism (although Rob Bell does not use this word). The problem is, however, that by so doing, Rob Bell merges two mutually exclusive concepts (exclusivism and pluralism) and thereby creates a contradiction. One cannot say with a straight face that there is one way and then say “there are other ways.” It is an illogical position to take and one that falters at every level. In my next post, I will tackle the hypocrisy of inclusivism, using Rob Bell’s book to show the very problem itself. Stay tuned. I miss you too!! Somehow I think that we've gotta throw ourselves an "after-graduation bash" when you get back in August. Thanks for the love and support. I read your post the other day on Arminius and Wesley, and the differences between Reformed Arminianism and Wesleyan Arminianism. Keep up the good work, bro. I can't wait to see you in August. Life here is kinda not the same without ya!